A new immigration regulation came into effect on 1 June 2015. Under the new regulation, all minors (children under the age of 18 years) will be required to produce, in addition to their passport, an Unabridged Birth Certificate (showing the particulars of both parents) when entering and exiting South African ports of entry. This regulation was in fact incorporated in the Immigration Regulations which came into effect on 22 May 2014, but until now, it has not been strictly enforced. As of 1 June 2015, the regulation is being enforced at all South African ports of entry and the implications thereof are significant. It is also understood that the regulation does not apply to domestic flights within the borders of the Republic. The travel and tourism industry did not receive the implementation of the regulation very well as it compels airlines to ensure that passengers have the necessary documentation before being allowed to board flights with minor children. The regulation will also be enforced by airlines and immigration officials across the board (land, sea and air). It is however the responsibility of travelers to ensure that their children have the correct documentation or risk being denied boarding. In all cases an Unabridged Birth Certificate will be required for minors departing and arriving in South Africa. They will not be allowed to travel without it. What are the requirements for UBC? A child travelling with both parents will be required to travel with their passport and Unabridged Birth Certificate. When a child travels with only one parent, he/she will require a passport, Unabridged Birth Certificate, an affidavit in which the absent parent gives consent for the child to travel and a court order granting full parental responsibilities, or legal guardianship of the child, or the death certificate of the absent parent. The affidavit should be no more than 3 months old from date of travel. In the case of a child travelling with a person other than a parent, the Unabridged Birth Certificate must be supplemented by affidavits from the parents or legal guardians confirming that the child may travel with that person, copies of the ID documents or passports of the parents or legal guardian, and the contact details of the parents or legal guardian. A child travelling as an unaccompanied minor has to produce not only the Unabridged Birth Certificate, but also proof of consent from both parents or legal guardians and contact details, plus documentation relating to the person receiving the child in South Africa. The latter documentation should include a letter stating the person’s contact details and residential address, contact details where the child will be residing, plus a copy of his or her ID document, passport or residence permit. 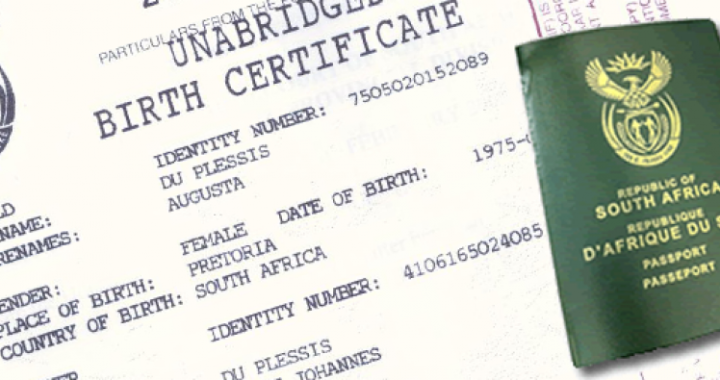 The Unabridged Birth Certificate currently costs R75.00. It can take up to 8 weeks to acquire an Unabridged Birth Certificate from the date of application. Travelling within the 8 week processing time will only be allowed in exceptional circumstances such as death of a family member or serious illness. In such exceptional circumstances applicants can apply for a letter from Home Affairs to confirm that an application for a certificate is pending. Since last year, Unabridged Birth Certificates have been issued automatically for newborns. So if your infant was born after 14 March 2013, you should be in possession of an Unabridged Birth Certificate. Posted in blog, News, Visit SA and tagged unabridged birth certificate. We applied for unabridged certificate last year December for our daughter who at the same time was applying for her South African Identity Document as she was required to have it for her matric year in 2018, The issue I have is that her unabridged certificate came back with only my information as the mother where as her younger sisters came back with both my husband’s and my information. My issue is this we are planning a trip out of South Africa in December and my worry is that she may not be allowed to cross over with the unabridged certificate that she has even though she will have turned 18 yrs by December as she will be turning 18yrs now in early September 2018 . Please help me out. Do I need to go to home affair to verify the blank information of my husband on the certificate that she already has or do we need to apply for another unabridged certificate that will show both my husband and my information. P.S. My Daughter has a valid South African ID and a valid South African Passport.